My daughter went back to school today after the winter holiday break; as she spends the next few days reconnecting with her classmates and getting used to waking up early again, I'll be spending the next few days taking stock of my Barefoot Books Ambassador business and charting a course for the future. I'll tie up loose ends from 2012 - take inventory, gather up all of my receipts and put my paperwork in order for tax time, figure out my best-selling books and those that did not sell so well, decide which events I want to do again and which ones were not successful enough for me - and then start working on 2013 - research new events, make a list of local pre-schools I'd like to approach about hosting book fairs, set some goals for where I want my business to be by the end of the year. Owning my own business is certainly challenging - all of the decisions are in my hands, and I'm completely responsible for my own success or failure - but I also find it liberating to be in charge of my own destiny. I'm learning new skills, meeting new people, earning extra money, building a business I can be proud of and setting a good example for my daughter. Would you like to be able to say the same at the end of 2013? Then you'll need to start now...and Barefoot is going to help you get off to a great start! Anyone who becomes an Ambassador between now and the end of February will have the opportunity to earn back the cost of their Ambassador Starter Kit by achieving $1000 in sales by February 28th, 2013. Your Starter Kit costs $139.99 and includes over $300 worth of Barefoot Books and products and business materials to get you started. How will you achieve $1000 in sales before the end of February, you ask? I won't lie - it will take some work...but you can definitely do it. My advice would be to aim for three to four events with somewhere between $200 and $500 in sales each...have a home party of your own and ask three of your friends to do the same...search for events in your community such as a Lunar New Year Festival in February...approach schools in your area about hosting book fairs...you can also make online sales that will count toward your $1000 goal, and any books you order for your own personal use also count toward your sales volume. You will definitely have to hustle to make it work, but then that hustle will serve you well as you build your business for the rest of the year! You will also earn the satisfaction of meeting your goals and starting down the road to becoming your own boss! Are you ready to start a brand new business this year? Does this sound like something that would be a great fit for you? Are you excited about the possibilities? Nervous about taking the leap? 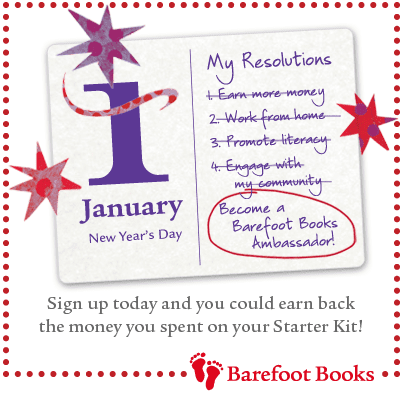 I am here to answer all of your questions and give you all the support you need to be successful - contact me ASAP because the sooner you sign up, the sooner you can get started toward meeting your first sales challenge as a Barefoot Books Ambassador!